Branding and identity design junkies, rejoice! Since we’re making the month of June You The Designer’s Logo Design Month, we’re going to teach you how to make your own business card. We’ll walk you through a five-step process, which you can modify later on and apply to your own design concept. It’s just a simple design, but you know what they say about designing stuff – less is better. Since we are doing a print-ready UPrinting business card (with bleeds and margins), download a PSD file of a Standard Business Card (2″ x 3.5″) at UPrinting’s Free Template page. 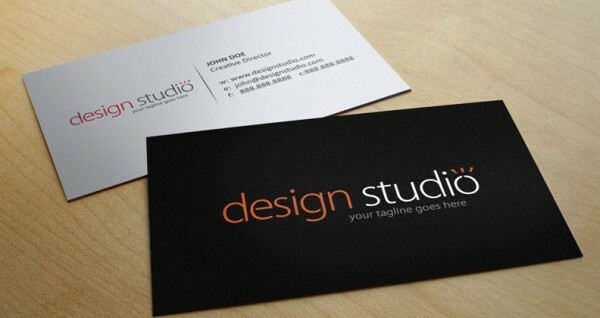 After downloading the business card template, let’s get the font that we’ll be using on our design. You can get the font from DaFont here, and make sure to install the font on your computer. Open the PSD file that you have downloaded, here’s what you’ll see. Now that we are all set up let’s start to design the front of the business card. On the layer panel, double click the layer named “Background” and name it to Front Background then hit OK. Double click the same layer again and you’ll end up in the “Layer Style” window. Click the Color Overlay to color the white background with black (which is #0c0c0c) and hit OK.
Press “T” for the type tool, and start typing your desired business name. For the orange colored text I used the color similar to our blog’s logo which is #d34d27 to give the business card’s logo more visual appeal. Also, I’ve added three orange lines above the letter “o” on the word “studio”. These 3 orange lines are just 3 commas from the same font, I just flipped it horizontally. I also added a tagline underneath the word studio, you could just substitute the tagline with whatever you like. Now that we’re done with the front side, this time we’ll do the back part’s design. Just repeat Step 1 until you end up with a white background. Now, right click that layer and select Blending Options, then choose Gradient Overlay and follow these settings. This time we need to place the logo from the card’s front design to the our current canvas. For questions, suggestions and any reactions regarding this tutorial, just leave a comment! Thanks! If you’ve got any request or a crazy idea you’d want to share with us, just hit us up on Facebook or Twitter. For more tutorials, or design news and inspiration, stay tuned and subscribe to our RSS Feed!